To register a new patron, select Circulation → Register Patron from the menu bar. The Patron Registration form will display. Mandatory fields display in yellow. 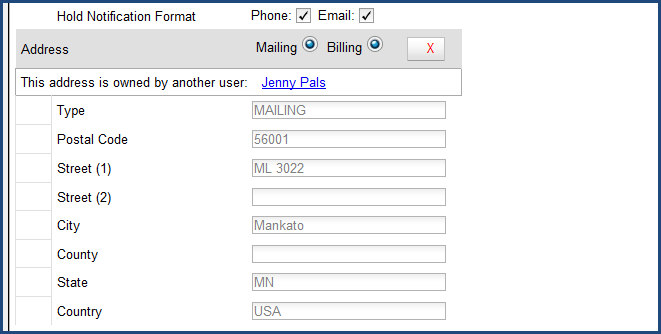 The Show Only Required Fields and Show Suggested Fields may be used to limit the options on this page. When one of these options is selected, it is possible switch to the other limited view or to revert to the original view by selecting Show All Fields. When finished entering the necessary information, select Save to save the new patron record or Save & Clone to register a patron with the same address. 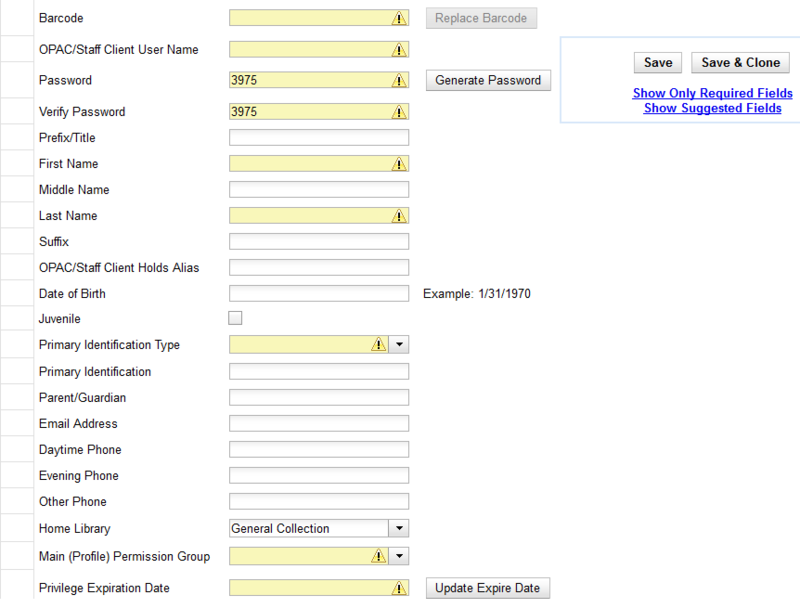 When Save & Clone is selected, the address information is copied into the resulting patron registration screen. It is linked to the original patron. Address information may only be edited through the original record. Requested fields may be configured in the Library Settings Editor (Admin → Local Admin → Library Settings Editor). Statistical categories may be created for information tracked by your library that is not in the default patron record. These may be configured in the Statistical Categories Editor (Admin → Local Admin → Statistical Categories Editor). Staff accounts may also function as patron accounts. You must select a Main (Profile) Permission Group before the Update Expire Date button will work, since the permission group determines the expiration date.